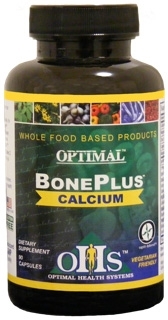 Optimal BonePlus Calcium contains a non-hormonal ingredient that actually helps to increase bone density! BonePlus Calcium, a calcium supplement for osteoporosis, is the first and best product on the market to combine the two most necessary and proven ingredients for bone health patented, amino acid chelated calcium and Ipriflavone (OstivoneTM). The benefits of calcium in halting and preventing further bone loss have long been recognized. And, the amino acid chelated form of calcium included in BonePlus is proven to be absorbed better than any other form of calcium. 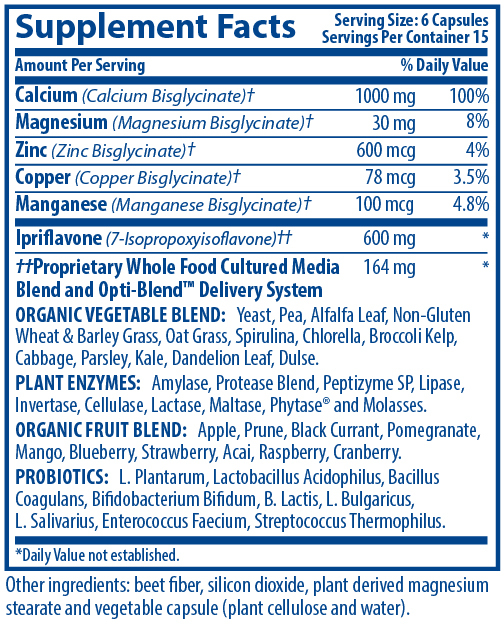 Amino acid chelated calcium is also far less toxic than any other form of calcium. This superior form of calcium is combined with Ipriflavone, a bioflavonoid, which is the only non-hormonal nutrient shown to successfully combat osteoporosis by increasing bone mineral density and enhancing calcium utilization. No other formula boosts bone health like BonePlus Calcium. Sedentary lifestyles and lack of load-bearing exercise (strength training), along with diminished amounts of calcium in foods today and the consumption of carbonated drinks, laxatives, white flour and other mineral-depleting substances are just some of the factors that have combined to make osteoporosis the fastest rising disease in America. Osteoporosis characterized by brittling and weakening of the bones is the third-leading cause of death in America. Every year, over 40,000 women die from osteoporosis-related fractures. For those who survive, fractures are often crippling, destroying quality of life and taking away the ability to care for themselves. Once thought to be a women-only disease, osteoporosis also strikes men and even teenagers. One in eight men and one in two women will sustain a fracture because of osteoporosis; and the costs and devastating results of this disease are rising astronomically. The public has been led to believe that taking Tums or other forms of calcium is enough. This is not the case. Calcium can only stop bone loss; it can't help reverse it. Besides, studies show many forms of calcium are not adequately absorbed, so aren't used by the body at all. BonePlus Calcium, from Optimal Health Systems, contains ingredients proven to be absorbed and to actually be used by the body to rebuild and strengthen bone. BonePlus Calcium contains the safe, highly effective amino acid chelated form of calcium, as well as Ipriflavone (OstivoneTM) a bioflavonoid that is the ONLY non-hormonal substance ever proven to rebuild bone density. Ostivone is backed by countless studies showing its benefits for bone health and for successfully combating osteoporosis. BonePlus Calcium also contains the amazing Opti-Blend Delivery System to ensure that nutrients are delivered to the sites where they can be used by the body.